The Sioux City St. Patrick's Day Parade is always festive and fun, but expect extra excitement and a bigger crowd this year as it falls on a Saturday. You can catch the parade on 4th Street from Iowa St to Water St at 3pm on Saturday March 17th. To enter a float or walking group, visit the parade website. McCarthy and Bailey's Irish Pub on Pearl Street in downtown Sioux City is the place to go in Siouxland for authentic Irish fare and Irish inspired food of all sorts, including Corned Beef and Cabbage, Irish Potato & Sausage Soup, and Fish & Chips, not to mention plenty of Irish beverages for parents and other adults. Because McCarthy and Bailey's is a pub, kids are welcome to come eat, but expect that in evenings, and on holidays like Saint Patrick's Day, the crowd may be a enjoying more than a wee bit of Guinness. I'd recommend taking kids for lunch, and/or on a day other than St. Patrick's Day itself. The Sioux City Symphony teams up with Grammy nominated Irish American group Cherish the Ladies to bring great music with an Irish flavor to the Orpheum Theater at 7pm on March 10th. Tickets available from $15-75. Before Cherish the Ladies, catch classic Irish music by some Sioux City musicians in the Orpheum Lobby, including Irish tin whistle from Father David Hemann and music from Father Patrick Walsh, Michelle Crossman, and David Napier. The event will also include Irish inspired appetizers and green beer. Catch Irish Fest at 5:30pm in the Orpheum lobby. Free for ticketholders for Cherish the Ladies. 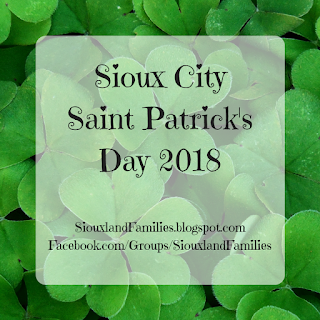 As St. Patrick's Day draws closer, this post will be updated with any new information or events we see!